Wayne Flanary, MU agronomy specialist, explains how to estimate soybean yields to a group of students at Hundley-Whaley Research Center's FFA Day. 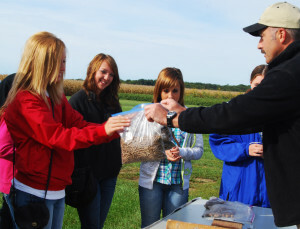 Each year many of CAFNR’s research centers host Ag Education days and Field Days. The events expose students to the diverse career opportunities in agriculture, and bring the latest agricultural research to the public. Thousands of students and producers attend the events at one or more of the 20 research centers that MU’s College of Agriculture, Food and Natural Resources operates across the state. Jerry Price, an ag education teacher for the Cainsville School District in Northwest Missouri, recently brought his students to Ag Education Day at Hundley-Whaley Research Center in Albany, Mo. “They learn a lot and I learn a lot too, and it helps get more in-depth in our classroom sessions” said Price, who takes his students to the event annually. This year students handled prawns, learned how to estimate soybean harvests, heard about developments in Missouri’s biofuel industry, evaluated forest products and even sampled award-winning chocolate milk at Hundley-Whaley’s Ag Education Day. Jackie Carlson brought her students from Jefferson, Mo. Her students will write a review of what they learned, then explore on of the topics in depth through a research project. “I always bring my Ag Science 1 students here; it’s a good way to motivate them to be interested in agriculture and want to be involved in FFA,” Carlson said. Tim Reinbott, superintendent of Bradford Research Center, presented on biofuels at the event, and knows first-hand how one presentation can spark inspiration. When Reinbott was in high school he attended a field day at Delta Research Center in Portageville, Mo. The experience inspired him to pursue a career in agriculture, and a specialty in agronomy. “In the late 70s our farm was being decimated by soybean cyst nematode,” Reinbott said. Grover Shannon, MU agronomy professor, showcased soybeans resistant to the nematode at the field day. The next year Reinbott’s family planted the nematode-resistant Bedford seeds and their harvest grew from 8 bushels per acre to 45. He knew then he would work in agricultural research. Sharing that research, with farmers or students, is a cornerstone of CAFNR’s mission. “Our College of Agriculture, Food and Natural Resources public field days provide an interaction between scientists and farmers. We provide some in-depth explanations of new products or trends. Farmers and visitors, as the late Dr. Harry Minor said it, ‘…can give us enough ideas for research for the next decade,’” Poehlmann said. Dusty Walter, MU agroforestry research specialist, asks students to evaluate weights of different forest biomass pellets at Hundley-Whaley Research Center's FFA Day. Forage System Research Center Field Day Sept. 29, and Management-Intensive Grazing workshop Oct. 4-6.